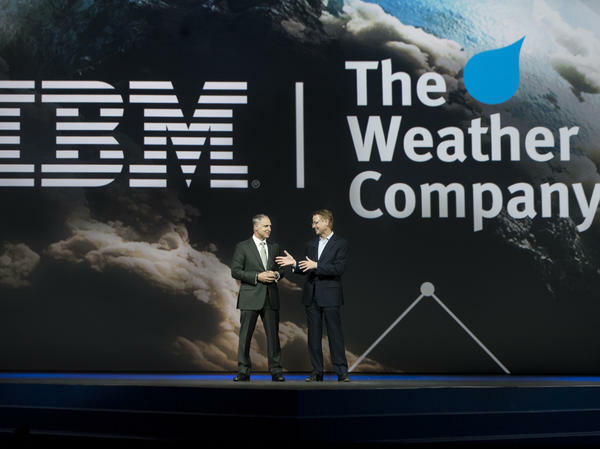 IBM Senior Vice President Bob Picciano and The Weather Co.'s chairman & CEO, David Kenny, speak at the IBM Insight Conference in Las Vegas on Wednesday. IBM's big-data ambitions have been well-known for years, thanks to the high-profile Watson computer that's been delving into all kinds of industries. For a while now, IBM has worked with The Weather Co., the outfit behind Weather.com, Weather Underground and The Weather Channel. At the same time, The Weather Co. has been trying to figure out a future for its big collection of meteorological valuables, which also includes vast sets of data and teams of experts. IBM has now agreed to buy its partner's product and technology assets, meaning apps and websites as well as the data-crunching platforms and teams behind them. The cable TV channel isn't part of the deal, but it will license weather forecast data and analytics from IBM. For now, fans of the app and website shouldn't expect any big changes to what they see. IBM and Weather Co. executives say the deal is geared toward businesses. "This is absolutely fuel for machine learning in Watson and designed to fundamentally change how business decisions are made," says Glenn Finch, who runs IBM's Big Data & Analytics group globally. Think airlines planning fuel consumption or working to reduce delays and airport congestion. Think logistics companies planning for a holiday rush, banks estimating where people may look for more mortgage loans, or stores preparing for bad weather. "As compared to traditional statistics of today, if a retailer needed to forecast inventory in a location, a lot of it is very statistical and looks historically," Finch says. "The accuracy of that forecast is really, really important. I can make sure I have the right number of snow shovels, Pop-Tarts and beer in a specific location this week. If I miss it this week, then I have an out-of-stock. If I have too many, then I'm reducing prices." The Weather Co. already collects a lot of data. Chief Information and Technology Officer Bryson Koehler says its operations rely on some 40,000 personal weather stations in the U.S. (he says the National Weather Service has around 3,500 weather reporting stations) and 100,000 such stations outside the country. What The Weather Co. doesn't have, Koehler says, is IBM's global reach and expertise in a lot of industries, such as agriculture, financial services, retail or logistics. "We are going to be able to dramatically expand the use of our data across all of these industry verticals where IBM already has deep expertise," he says. IBM isn't saying how much it's paying for The Weather Co. assets, but the two are looking to close the deal in the first quarter of 2016.